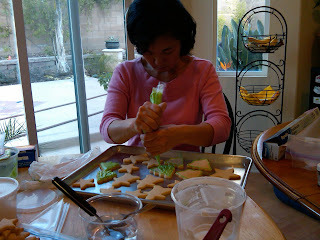 Last Saturday I taught a couple of ladies from my church how to make decorated sugar cookies. 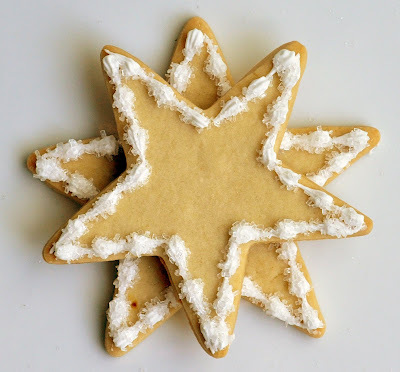 In preparation for this lesson I was doing some research on examples of decorated sugar cookies in shapes of stockings, Christmas Trees, Snowmen, etc. and I came upon some pictures of a 3D Christmas Tree made from different sized stars. I was so impressed at the wow-factor of this simple design I HAD to make some! 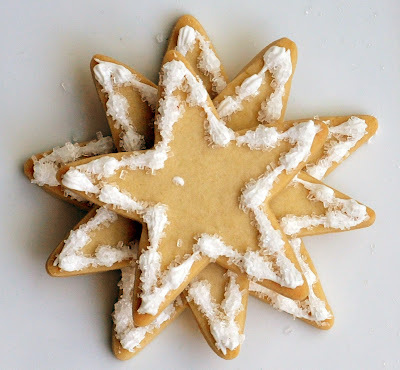 It just so happened that I had a star cookie cutter set that had 4 different sized stars. 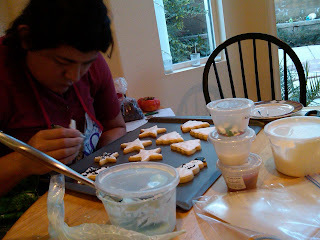 In total I used 5 different cutters (I had a mini star cutter that I added to the top). 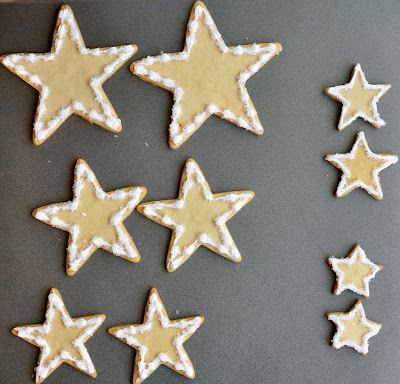 At fist I did one of each star but I realized it was too short so I doubled each star. When I stacked them it looked awesome! 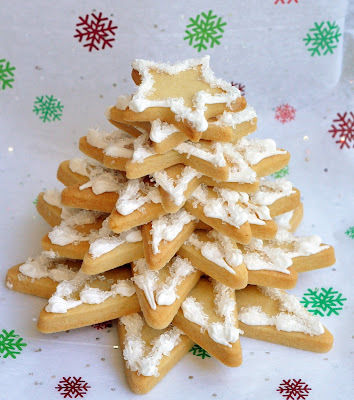 In total I used 10 cookies per tree. If you're going to make more than one... get ready to make LOTS OF COOKIE DOUGH. I used 4 POUNDS OF BUTTER to make about 11 of these Christmas Trees. 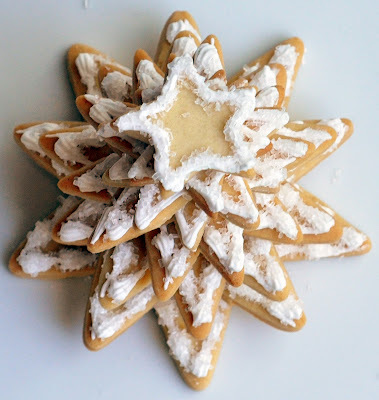 I outlined each cookie with a shell border and then sprinkled crystal sugar to make it look like snow. To stack them, I didn't wait till the icing dried. I started stacking them right away mainly because I didn't have time but it was good because it acted as an additional glue to hold the tree together. You can wait till it dries hard but just make sure you have A LOT OF ICING between the layers otherwise, it won't touch the other layers. 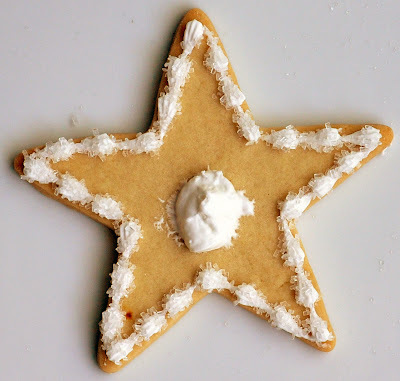 Get the biggest cookie and put a good amount of royal icing in the center. Place the second biggest star on top. Continue with the next biggest star. Continue the process until you finish with the smallest star. You can attach another star on top but I wrapped all of mine in cellophane and I knew it wouldn't stay well so I left it out. That is such a pretty tree! fantastic!